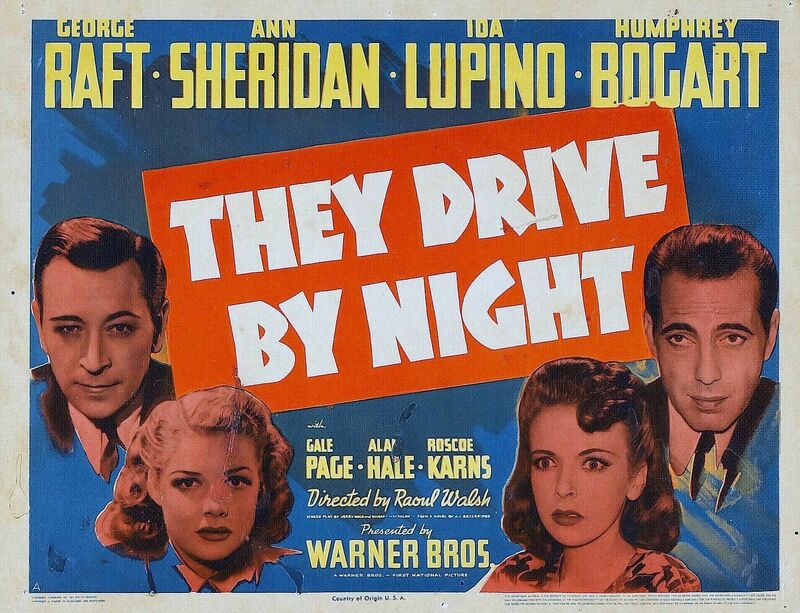 From director Raoul Walsh comes one of his trademark crime dramas, They Drive By Night. This 1940 film is based on the 1938 novel “Long Haul” by author and screenwriter Buzz Bezzerides. George Raft and Humphrey Bogart star as brothers Joe and Paul Fabrini, who work together as truck drivers. This business of delivering fruit is much more dangerous than it sounds. One night, on the route, the Fabrini brothers pick up a waitress named Cassie (Ann Sheridan). The three travelers witness a terrible accident when another trucker falls asleep at the wheel. In addition, Joe and Paul owe money to a loan shark who wants to repo their truck. After an accident of their own, the brothers decide that it’s time to get out of the driving side of the business. With the help of trucking boss Ed (Alan Hale), it is possible that they could succeed in finding better opportunities than the dangerous driving they’ve been living off of. But in the process, the brothers – Joe in particular – get roped into shady dealings and the murderous plotting of Ed’s wife, Lana (Ida Lupino). This is not your typical crime drama. The genre is usually filled with burglars, robbers, murderers and gangsters, but this film follows two hard-working men that are simply trying to make a living. These men are, by all accounts, very likable. They care very much about the women in their lives, giving them a bit of a soft edge despite their labor-hardened exteriors. 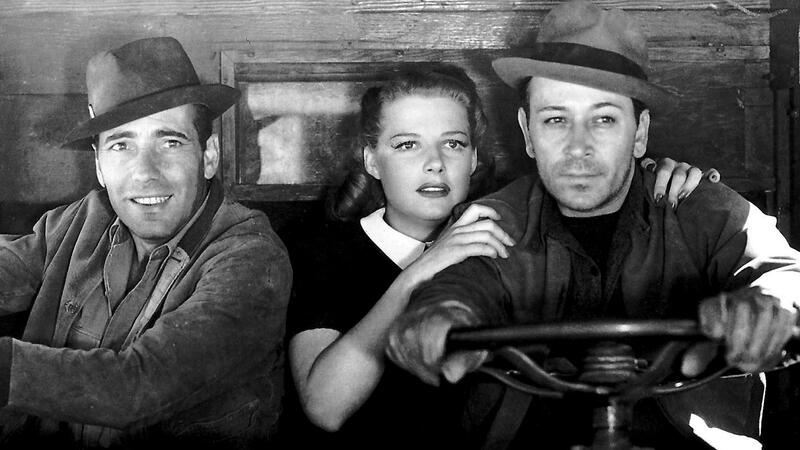 Humphrey Bogart in particular endears the audience to his character, first through his obvious admiration for and appreciation of his wife Pearl (Gale Page) and later through the struggles that he deals with in the aftermath of the accident. Despite the fact that the premise is a bit atypical, a very good (albeit inconsistent) level of suspense is built around these characters. The film is sometimes slow, leading the lives of these two main characters to appear almost pleasant, but the twists more than make up for these less exciting scenes. The film is punctuated with very tense moments that keep the viewer interested. The biggest downfall with this film is that it ever-so-slightly nears the edge of – you guessed it – the always-dreaded corny cliff. Some of the dialogue is extremely cliche, and some of the acting very over-the-top. For one character, though, this over-the-top style works extremely well: Lana. Ida Lupino is absolutely perfect in this role. You can tell from the very first frame in which she appears that Lana is going to be manipulative and cause trouble for the brothers. She’s very sneaky, very calculated and very, very crazy. Ida’s somewhat exaggerated performance only heightens the viewer’s suspicion that Lana is completely off of her rocker. I love Ida Lupino in this movie! I agree with you about some of the over-the-top acting. It is a bit much in places. I think that Ida is very underrated. She completely outshines the rest of this cast in my opinion (which isn’t easy, considering my love for Bogie haha) and has been just phenomenal in everything I’ve seen her in! Previous Previous post: Films in 2012: April wrap up!